I was recently offered the chance to try one of Hurraw's lip balms. 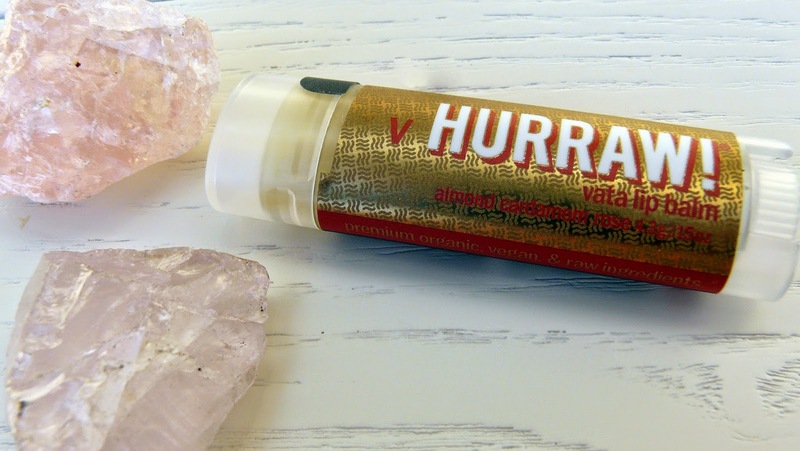 Hurraw make a wide range of lip balms that are all vegan, Leaping Bunny certified and are made using raw, organic and fair trade ingredients. I have tried a few of their lip balms before and I loved them. I was very kindly sent the Vata balm from their unique range inspired by the basic Ayurvedic Dosha principles. According to Ayurveda (the traditional medicine of India) there are three Doshas: Vata (wind), Pitta (fire & water), and Kapha (water & earth). These elemental forces manifest into our mind and body characteristics and a unique combination of these three Ayurvedic principles (Doshas) are said to be present in everyone. 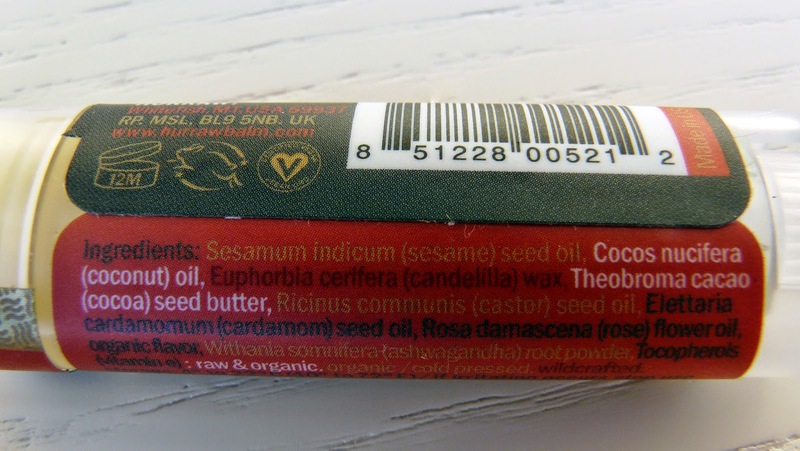 This lip balm smells amazing; almond is one of my absolute favourite smells and tastes (the new Bakewell tart Nakd bar is the best thing ever!). Delicate undertones of rose and hints of spicy cardamom go so beautifully with the almond. 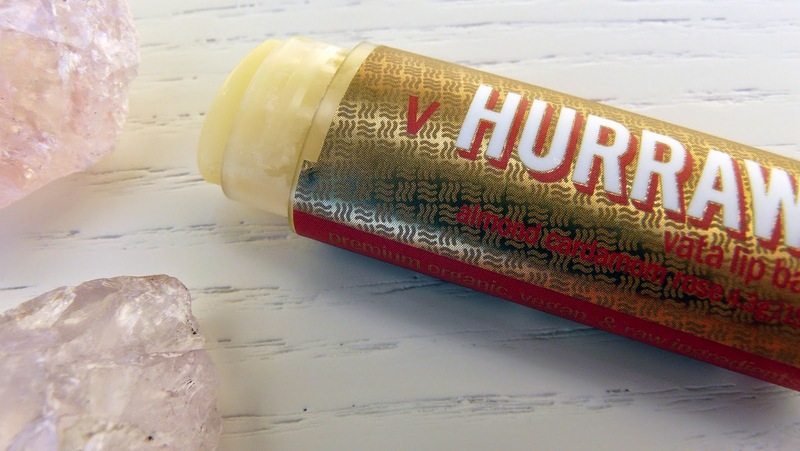 The Vata balm is smooth, creamy and super moisturising but doesn't feel greasy on your lips. I have found that it stays on well even after talking and sipping on water etc. and makes my lips feel really soft and moisturised. I am a bit of a lip balm fiend and have at least half a dozen different brands and flavours stashed in my handbag! I usually pick and mix between them all depending on which flavour I fancy, but since trying this one I've found myself reaching for it every time. 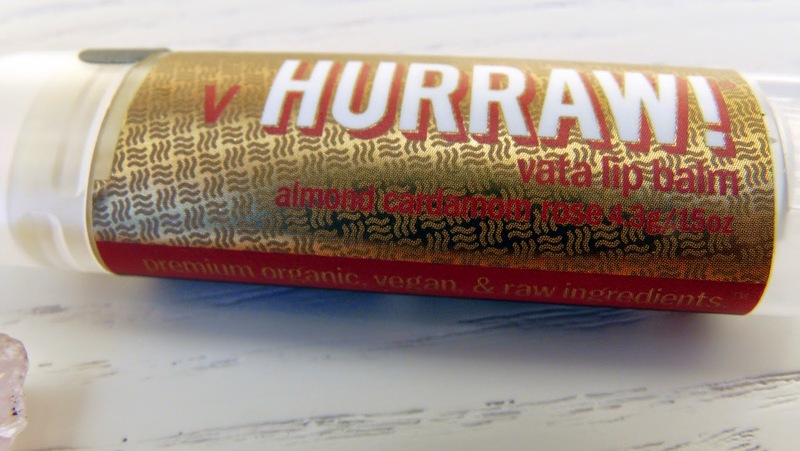 Hurraw Vata is my new favourite lip balm and I will definitely be buying another when this one has run out. It retails at around £3.99-£4.50 and can be purchased in the UK from several websites including Lucy Rose, Love Lula, My Pure, Ebay and Cute Cosmetics. The other two flavours in the range - Pitta (coconut, lemongrass and peppermint) and Kapha (grapefruit, eucalyptus and ginger) - sound amazing too, so I might have to try those as well! Unless you've been hiding under a rock, you'll have probably heard of the latest happening in the vegan world: chickpea meringues. I'm not talking about chickpea-flavoured meringues, I'm talking about meringues made from the water from a tin of chickpeas! I know it sounds a little weird, but vegan food blogger Goose Wohlt saw a French video in which chocolate mousse was created using the whipped chickpea water. Goose Wohlt coined the term aquafaba for this liquid (loosely, Latin for water = aqua, bean = faba.). The news that vegan meringues could be made this way spread like wildfire amongst the online vegan community, with a dedicated Facebook group set up for people to share their recipes, successes and failures. I have never made egg meringues and I have only attempted vegan meringues once before using a commercial egg replacer but I did not have much success. After seeing some amazing pictures in the Facebook group, I couldn't wait to have a go myself. I have made chickpea meringues twice now and both times they have been a huge success. They are lovely and crisp and they melt in your mouth. They have been a hit with my friends and family - my omnivore sister said that they tasted better than egg meringues! I followed the basic guideline recipe from the group, which suggests using the drained liquid from one 15oz can of chickpeas (1/2 to 3/4 cups) plus about 1.33 times the volume of your liquid in sugar. The first time I used 1/2 cup of chickpea water and 1 cup of caster sugar. I used a lot of sugar as the chickpeas I used contained salt and I didn't want to be able to taste it. Whilst the meringues turned out really well, I could slightly taste the salt in them. Don't get me wrong, I absolutely love the combination of sugar and salt (I was mixing my sweet and salty popcorn way before you could buy packets ready made!) but I didn't think it tasted right in the meringues. I piped the first batch into nests and they held their shape really well. I was going to eat them with berries and whipped soya cream, but I didn't have any in the house and I didn't have any coconut milk in to make coconut cream either, so I made up some warm chocolate sauce. They were still delicious though! 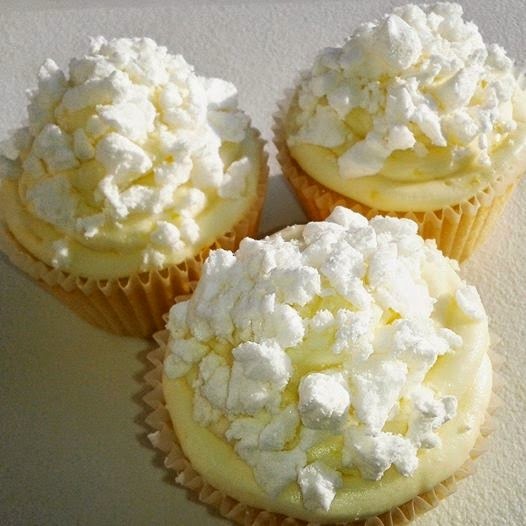 I crushed the leftover meringues up and sprinkled them on top of some lemon cupcakes which were so good. 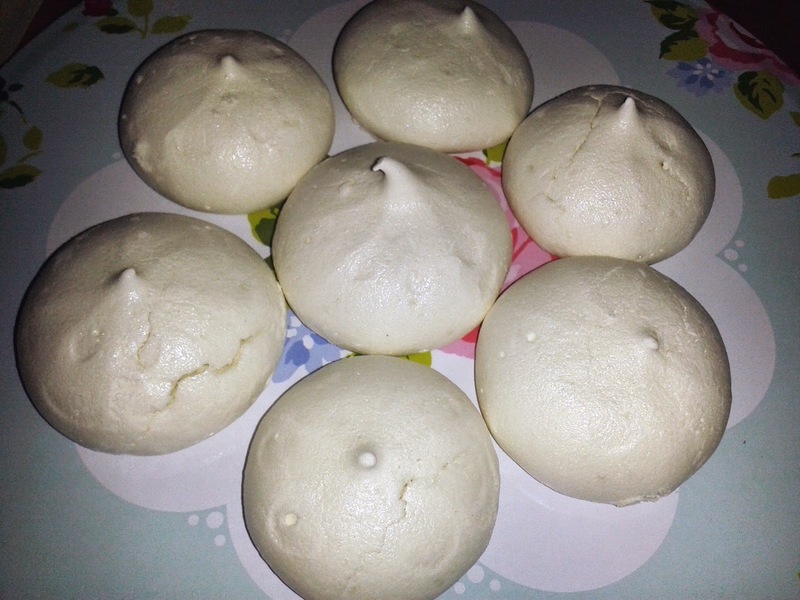 The second time I made the meringues, I used unsalted chickpeas (Co-op's own brand) and they tasted so much better. This time, I still used 1/2 cup chickpea water but I used less than 1 cup of caster sugar. I'm not sure on the exact amount, I just added the sugar a tablespoon at a time until the meringue mixture was really thick and started clinging to the beaters. I would suggest just playing around with the amount of sugar you use depending on how sweet you like your meringues, but I have found more sugar equals a stiffer mixture. Plus it's totally fine to try the mixture to test its sweetness since there's no icky raw egg whites in there! 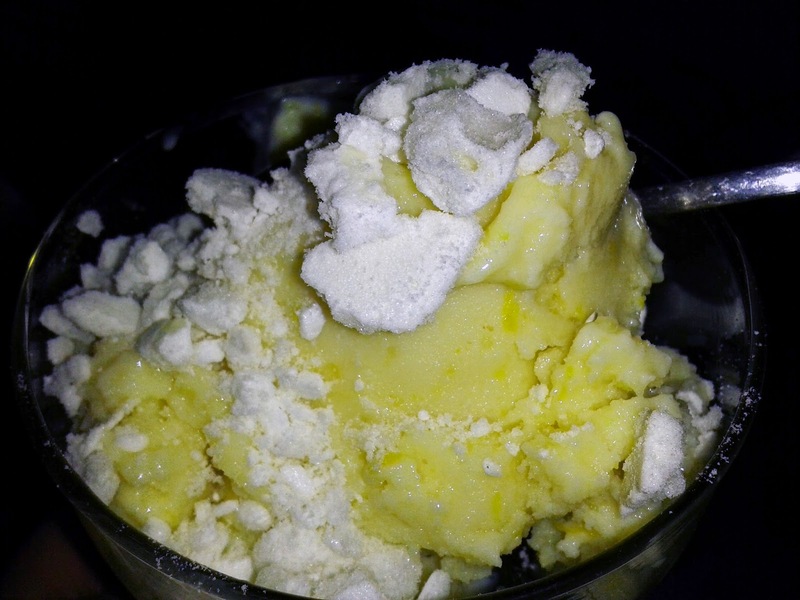 I attempted to make lemon meringue ice cream with the amazing ice cream maker I got for Christmas but it didn't turn out so well. It still tasted amazing but the texture wasn't quite right, but once I've perfected the recipe I will share it here. 1. 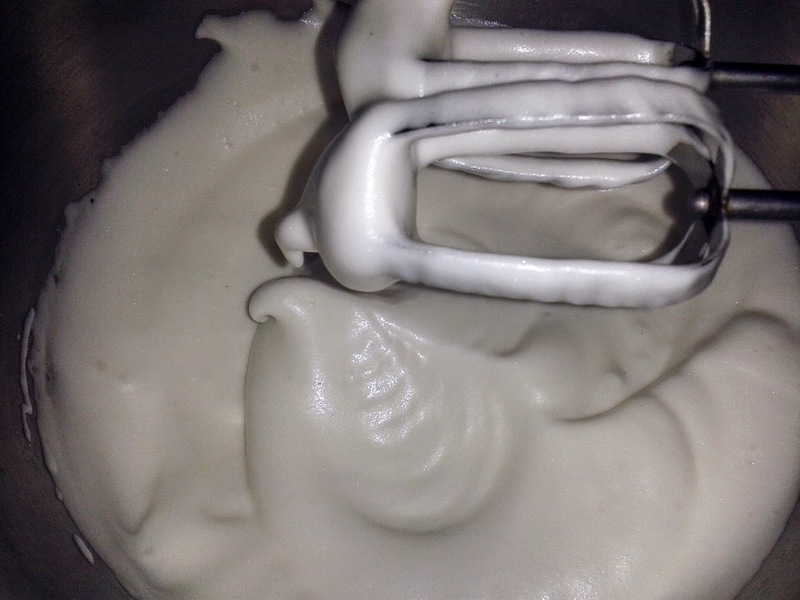 Pour the aquafaba into a large bowl and whip using an electric whisk or food mixer until it turns white and foamy - the soft peak stage. This could take a few minutes, so be patient. 2. 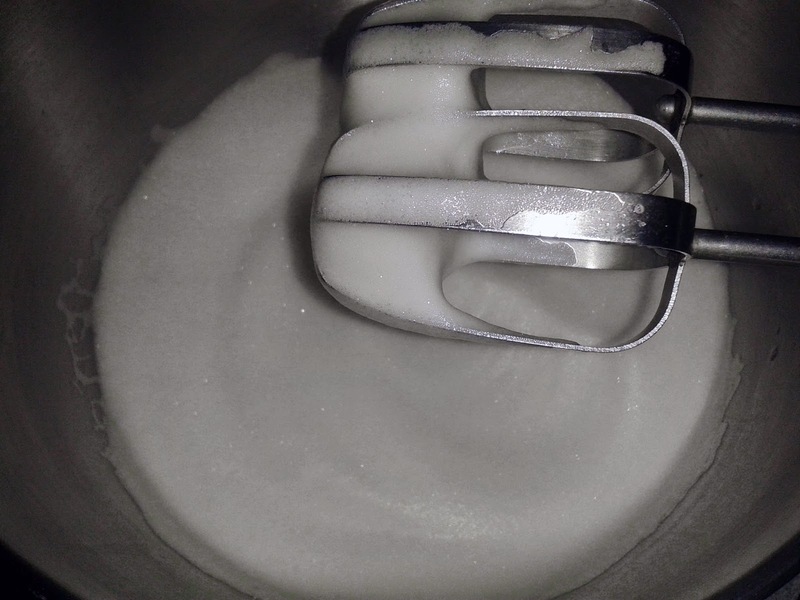 Keep whisking the aquafaba and slowly add the sugar about a tablespoon at a time, making sure you mix it in well before adding the next spoonful. The mixture should look glossy and hold its shape in stiff peaks. Try turning your bowl upside down; if the mixture doesn't pour onto your head, it's ready! 3. Once you are happy that your mixture is stiff enough, taste it to see if it is sweet enough for your liking, then add more sugar if necessary. Make sure the mixture isn't gritty, if it is then whisk it a little more. 4. Spoon or pipe your meringues onto a baking tray covered with baking parchment. Bake at around 100C/215F for 90 minutes. 5. When the meringues are done, turn the oven off and leave them in to cool to room temperature with the oven door ajar. 6. Store the meringues in an airtight container. They should stay fresh for a few days. I can't wait to experiment with more meringue recipes such as pavlova, lemon meringue pie and macaroons! 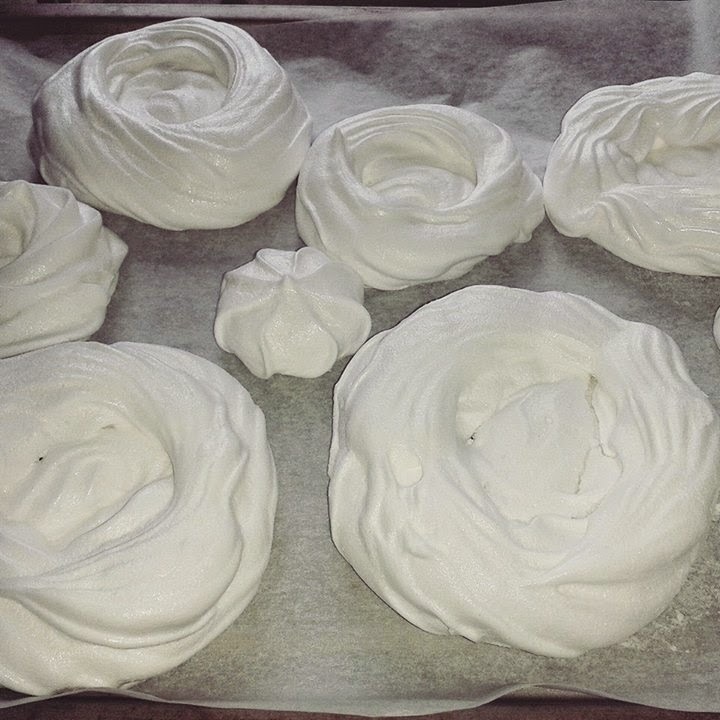 Let me know if you have a go at making vegan meringues, I'd love to hear how they turn out. A couple of weeks ago Jamie and I had a day off so we decided to go out for lunch at the Wildebeest Cafe in Falmouth (you can read my first review of the Wildebeest here). 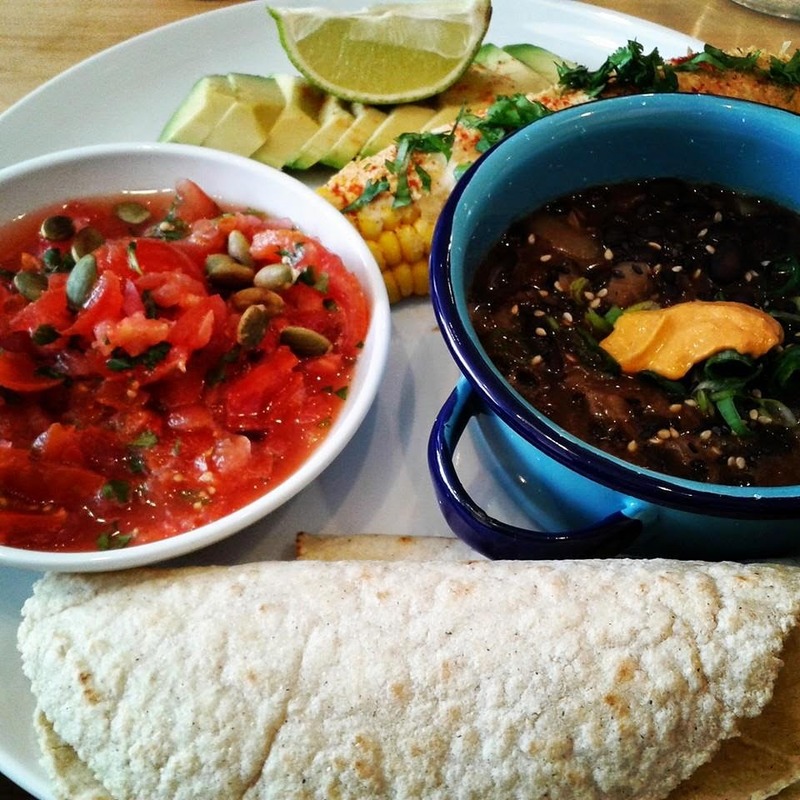 I absolutely love the Wildebeest; the food is simply outstanding and it feels great not having to study the menu to check for animal-derived ingredients, as all the food and drink they serve is completely vegan. The Wildebeest was really busy when we went so I was glad I booked a table! Well-behaved dogs are allowed in so we brought Jack with us. For our main course Jamie and I both opted for the 'Frijoles de la Olla' - Mexican beans with chipotle cashew cream, salsa, sliced avocado, corn on the cob (topped with vegan sour cream and nutritional yeast) and handmade gluten-free corn tortillas. It was so tasty and filling and I would love to try and make this dish at home, although I doubt I could make it as well as the Wildebeest does! For dessert Jamie went for the chocolate brownie with hazelnut ice cream. 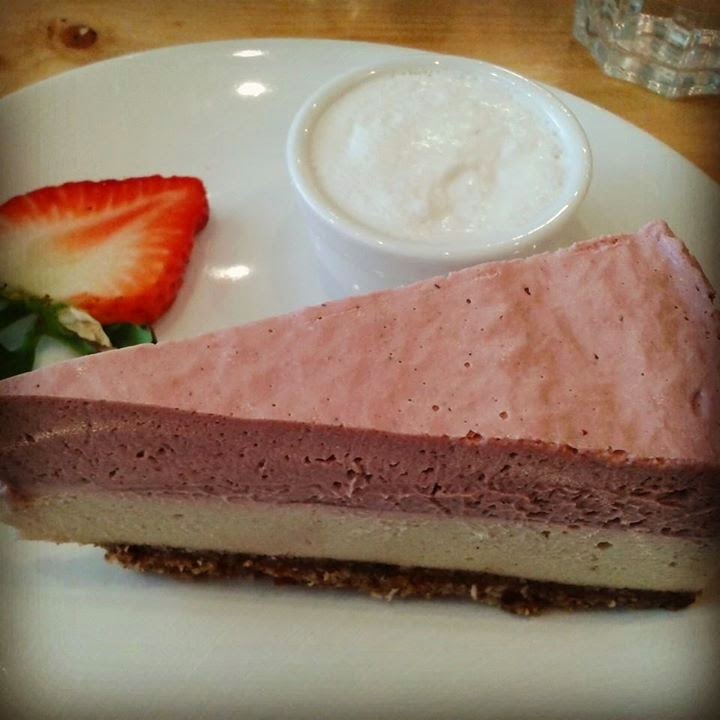 As tempting as the brownie was, I decided to try the raw strawberry and vanilla cheesecake as I had the brownie last time I visited. The cheesecake base consisted of the likes of chopped nuts and dates and served as a healthy alternative to the traditional biscuit base. The filling was unbelievably rich and creamy, and the flavours of the strawberry and vanilla were heavenly. The cheesecake was served with a dollop of delicious coconut cream and I can honestly say that this may just be the best dessert I have ever tasted. I could have easily devoured another slice! 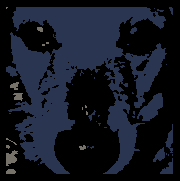 I can't wait to return to the Wildebeest to sample some more amazing vegan food. 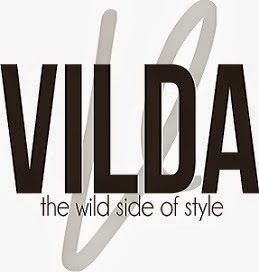 I have featured the Wildebeest Cafe in my guide to the top ten vegan-friendly things to do in Cornwall, which you can read over at Vilda Magazine. Issue 4 of Vegan Life magazine is probably my favourite one yet. 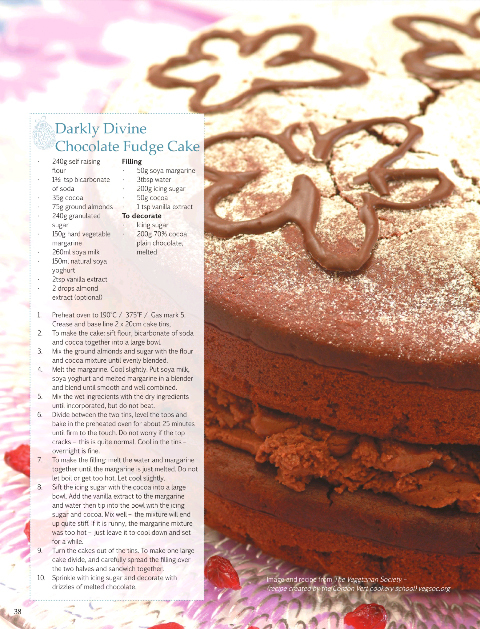 It is crammed with amazing recipes that are admittedly more appealing to me than many of the previous ones, probably because they are for sweet things! 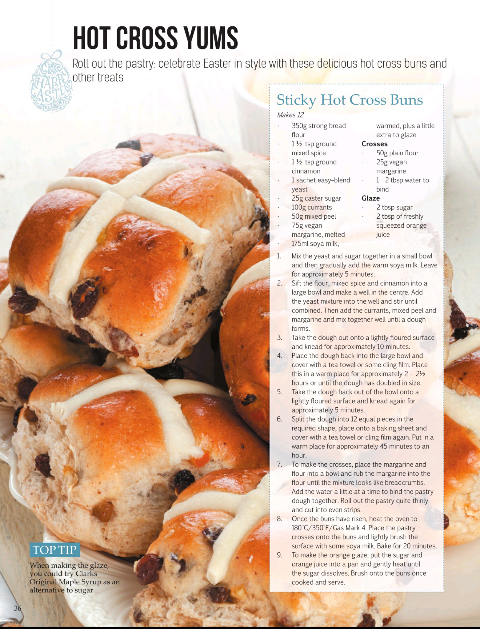 Some of the many recipes that caught my eye included hot cross buns, rocky road, chocolate fudge cake, chocolate fridge cake, fruity chocolate cake, almond butter fudge and pistachio cake with orange blossom flower water. 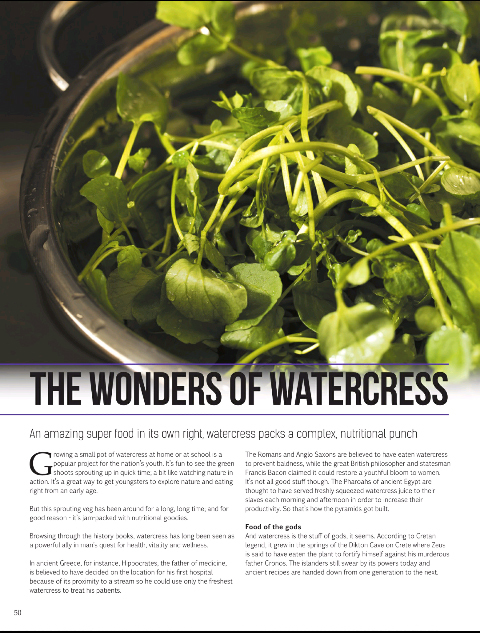 Issue 4 also features an interesting article on the benefits of watercress. I love reading about the nutritional benefits of food, and was pleased to learn that watercress is high in vitamin C, vitamin E, calcium and iron among others. There is also some evidence that watercress may help to prevent cancer due to its antioxidant and DNA preserving properties. Watercress also contains a compound called PEITC (phenylethyl isothiocyanate) which may have the ability to ‘turn off’ a signal in the body, starving breast cancer cells of essential blood and oxygen, thus suppressing their development. 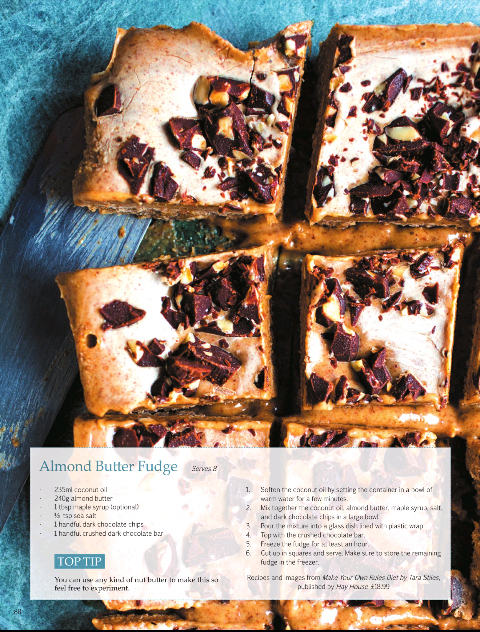 The digital version of Vegan Life magazine has now been updated to be more interactive. Special features include swiping images to view them like a slideshow gallery and a 'touch here' icon that reveals more text or images, plus you can now scroll down a page to read a full article instead of having to touch to turn a page. 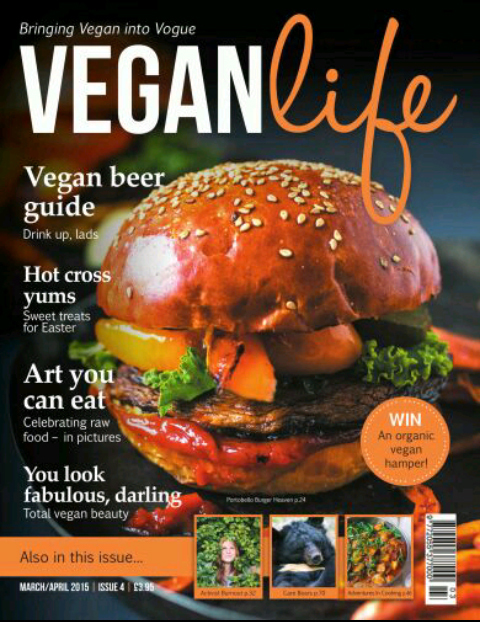 The next issue of Vegan Life magazine is due out very soon, and from now on it is going to be released monthly! You can subscribe to the paper version here and the digital version here.